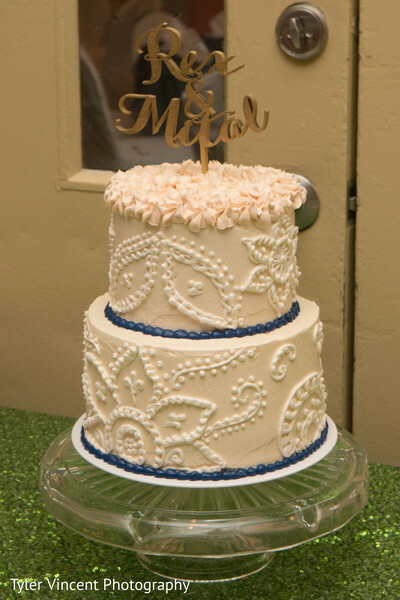 Mital and Rex hosted an idyllic wedding reception at the Lakeview Golf Resort and Spa, where metallics and regal colors were cornerstones. 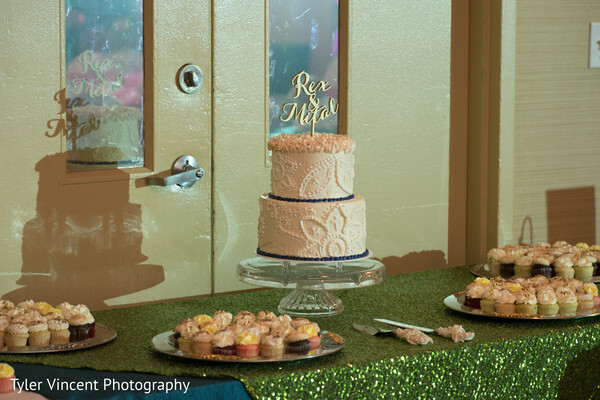 In keeping with the outfits of the newly weds, Zaccagnini’s Morgan Town Florist set up the dessert bar on dark green sequin linens, while the guest tables were adorned in magenta sequin linens with floral tablescapes. 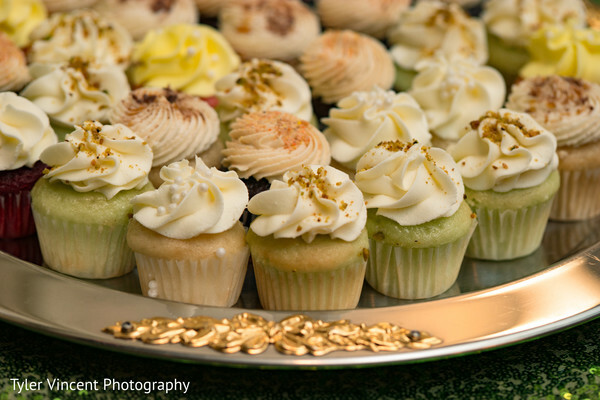 Almost Heaven Desserts (aptly named) were responsible for the delectable dessert spread, that comprised of an assortment of frosted cupcakes, and the wedding cake with beaded design with a vintage “Rex & Mital” topper. Navy blue drapes and olive green curtains surrounded the ballroom. Our superstars of the evening coordinated their ensembles, with Rex in a slate grey tuxedo worn over a navy blue shirt, and Mital in a royal blue, embroidered floor-length anarkali featuring stunning zari work elements. Hayley Carlin from Toni Exquisite Hair gave Mital a braided updo, thus letting her gorgeous gold chand balis take center stage. Beauty by Joy Lager finished Mital’s look with dewy coral blush and minimalistic smokey eyes. 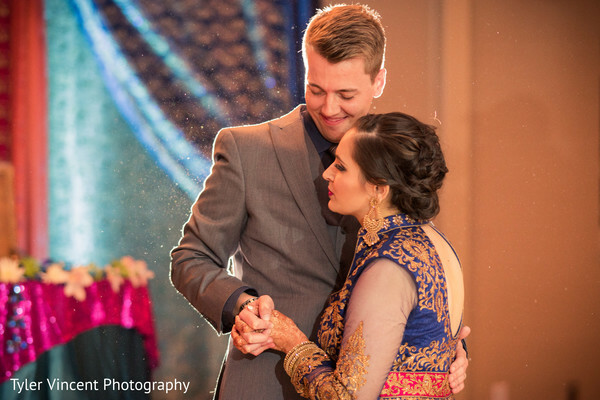 Planet DJ Productions entertained the guest with their mix of Bollywood numbers and pop chartbusters. “The amazing crowd loved to have fun and dance! 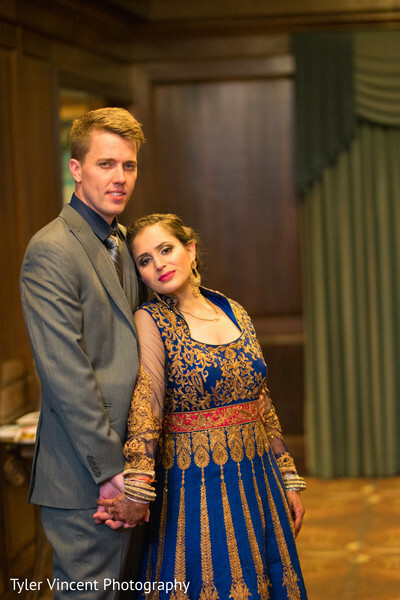 The dance floor was fully packed from the second we started till the extended time we kept going till after the party stopped,” said photographer Tyler, one half of the terrific Tyler Vincent Photography duo. Go through their gallery for inspiration on how to incorporate dark colors to make your big party come alive! 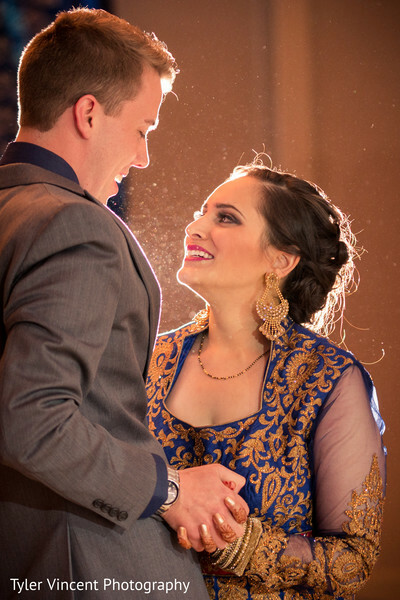 The marriage of two cultures is always intriguing to us, and if you feel the same way, visit the blog tomorrow for more such wedding planning inspiration! Planet DJ Event Lighting and Planet DJ Productions are members of the Platinum Guide. Love what you see? Explore their portfolios.